Hot Dog Boy, also known as my younger son, is in a pickle phase. Luckily, Costco sells huge jars of those adorable tiny dill pickles - they're so small I really want to call them "picklets." We're going through them at a respectable clip these days, and last week we finished up a jar. I was about to spill out the brine but my husband stopped me. "Let's pickle some eggs," he said. I must have looked at him strangely, because he said it again. Then he explained that when he was growing up, his mother would save jars of pickle juice and drop in warm, peeled hard-boiled eggs. After a few days, the eggs were pickled. I gave it a shot. It made sense. I like pickles. I like hard-boiled eggs. And I like making good use of leftovers. I boiled up some eggs, peeled them clean, dropped them in the jar, and put the jar back in the refrigerator. Five days later I fished one out, cut it in half, and took a bite. It had firmed up quite a bit, and the outside tasted like - well, like pickles. I fell in love. See all the eggs in the jar above? Gone in about five minutes. Good thing I'm not getting my cholesterol checked anytime soon. Note to self: Must eat more pickles. You'll never throw away pickle juice again. Put the eggs in a saucepan and cover them with cold water. Bring the pot to a hard boil, then immediately turn off the heat and cover the pot. Leave it alone for 20 minutes. 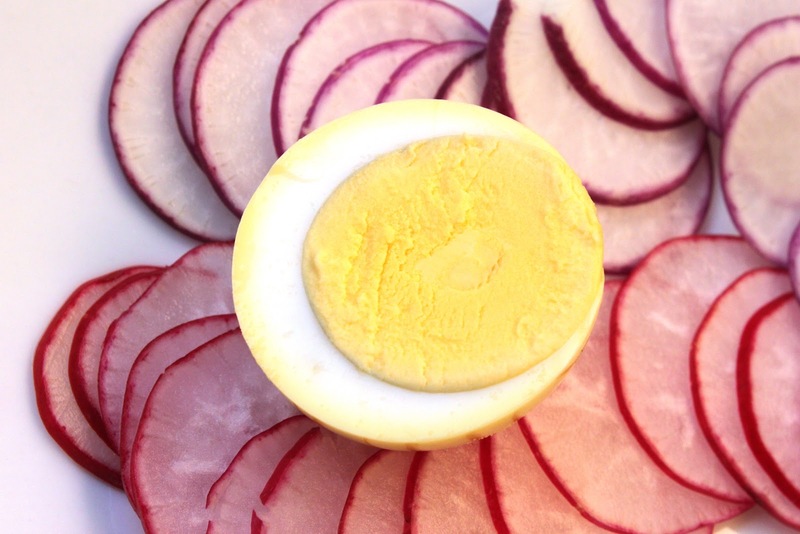 Drain the eggs, run cold water over them, and peel them when they're cool enough to handle (but still warm).Drop the warm eggs into the jar of pickle brine. Put the lid back on the jar and store in the refrigerator for at least 5 days. Longer is fine. Serve as a snack, or eat them out of the jar standing at the kitchen counter (much more likely in my house). I love pickled eggs! I used to make them all the time when I had chickens..
Do you have a good homemade pickle recipe? I made refrigerator pickles once long ago -- it was fun, but they weren't quite right. What a great idea! I love it. Once we're not constantly traveling, I will try this. @Rocky - everyone around here is getting chickens. It seems to be back in fashion, even in the city. I'm tempted but my husband has a firm "no pets" policy, so I don't think it's going to happen anytime soon. @Josephine - I've only made pickles a few times. I really liked the red carrot pickles I made last year (http://www.inerikaskitchen.com/2010/04/pickled-red-carrots-with-wild-fennel.html) but they're not what I would call traditional. @Ana - traveling, me too. Hope yours settles down soon! My son does this all the time. I find pickle juice in the back of the fridge, and if I throw it away I get yelled at. But scared to actually try one. Alemap - don't be scared - they're terrific! 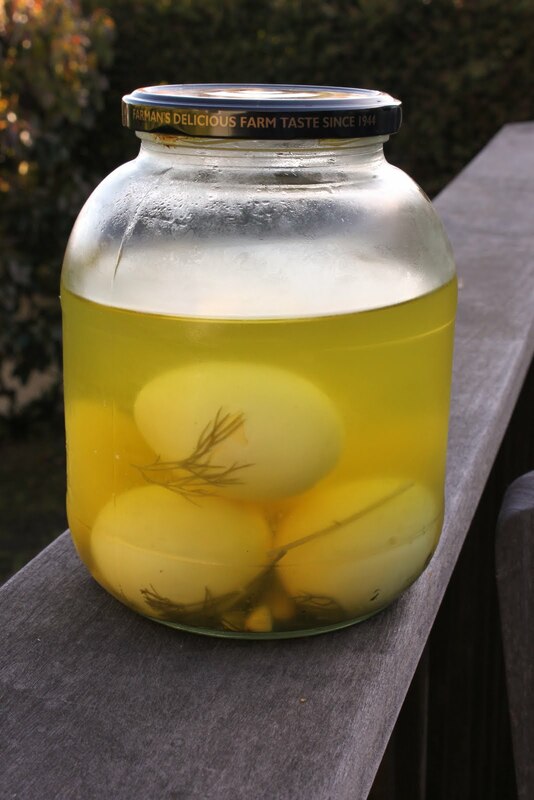 David: There is virtually no max time to hold eggs in pickle brine. I took some to a get together last week. Following our meal someone asked, to the group at large, who made the pickled eggs. Really a hit. Oh yes, they were well past a year in the back of the beer fridge. Almost hard enough to bounce and fantastic. Numerous complements. We in Canada get most of our pickles in a one litre jar. Convenient as a litre jar holds 12, one dozen boiled eggs. I have also mixed olive and dill brings for a wonderful pickled egg.